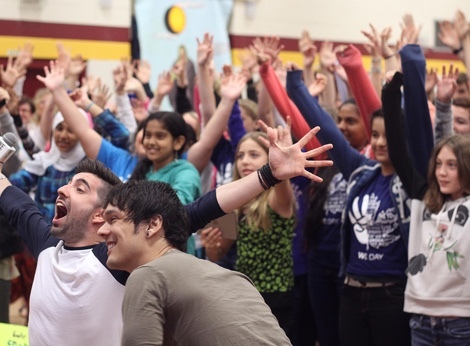 Unique stories inspire youth to create change in their communities—and around the world. As part of a family of organizations, WE Charity works closely with ME to WE to deliver annual youth speaking tours that motivate young people to create change in their communities. 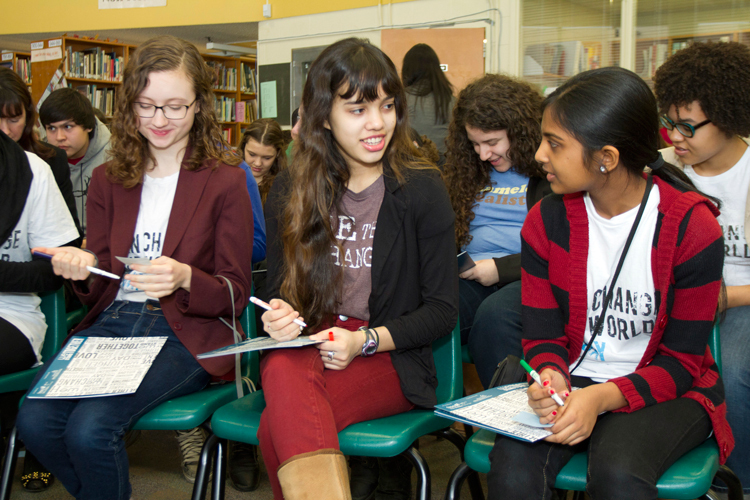 Sponsored tours—with past and present partners like Club Penguin, Investors Group, National Bank Financial Group, PotashCorp, Oprah’s Angel Network, RBC, TELUS and others—bring a team of two speakers across the continent, visiting schools during the academic year to inspire youth to become agents of positive change. Through their unique stories, this engaging team inspires with incredible ways to get involved and transform the world through active global citizenship. We have a variety of speaking options available for your school. However, please note that due to high demand we typically book our speakers at least two to three months in advance. If requesting a speaker is not financially or geographically feasible, please connect with your Educational Programming Coordinator about our virtual speaking options. Outreach speakers deliver tailored presentations of their personal story, WE Charity’s history and our holistic and sustainable development model. Some of our speakers also focus on Aboriginal programming. Outreach speakers are the best option if you are fundraising for Free The Children’s WE Villages, and would like to increase students’ awareness about your club’s goal, and springboard your school’s involvement with WE Charity. These team members are trained, professional speakers with passion for and experience with WE Charity programming. They can speak to most ages and can customize their speeches to your specific needs. Presentations are about 30 to 40 minutes long with an optional Q&A session at the end. We suggest an audience of Grade 3 and above but you know your students, so we leave this to you. This opportunity is offered at no cost to your school. However, there may be an honorarium associated with the speech if you are located more than one hour from our head office in Toronto. For more information about Outreach Speaker opportunities available in your region, please complete our Outreach Speaker Information Request Form, here. Thanks to the generous support of select sponsors, WE Day and WE Schools are able to offer speaking tours that are free of cost to schools. They include a one-hour keynote address to your entire student body as well as a two to three-hour workshop for up to 30 students. Additional educational resources supporting speaking tours are also available online. Tour Speakers are different from Outreach Speakers because they focus on a specific theme—the environment, for example, or education—whereas Outreach Speakers provide a customizable overview of WE Charity projects. If you would like to book a Tour Speaker please contact [email protected] or call 1-416-925-5894. The ME to WE Speakers Bureau represents some of ME to WE’s best and most high-profile speakers including Marc and Craig Kielburger, and Spencer West. There is a more significant fee associated with each Bureau speaker. We ask that clients also cover travel/accommodation costs for the speaker and an additional support person. The content of these speeches is speaker-specific and can be customized. If you would like more information, or to book a ME to WE Bureau Speaker, please click here. To speak to a ME to WE representative, please call 1-416-964-8942.